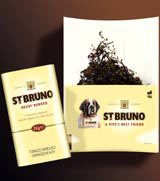 Manchester-based Shoot the Moon is to revamp the packaging of market-leading St Bruno’s pipe tobacco, the product’s first redesign in over 15 years. The five-figure revamp, which launches in July, follows the continued tightening of tobacco advertising laws and the subsequent need for packaging to play a stronger role, says Shoot the Moon sales and marketing manager, Eric Riley. The redesign is a subtle update, as research showed customers were traditional and loyal to the brand, says Shoot the Moon creative director Steve Fletcher.